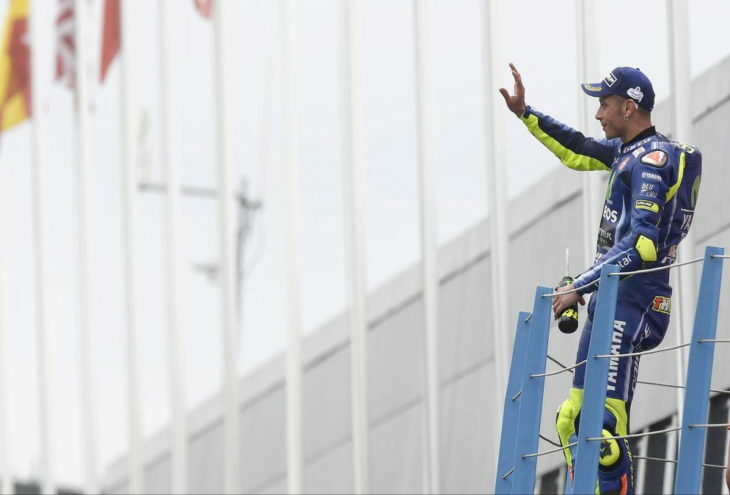 Valentino Rossi (Yamaha) took an important victory at Assen earlier today to close within 7 points of the MotoGP championship lead, now held by Andrea Dovizioso (Ducati) who finished fifth. On the podium with Rossi were Danilo Petrucci (Ducati) in second and Marc Marquez (Honda) in third. Previous points leader Maverick Viñales (Yamaha) crashed mid-race while working his way to the front from the fourth row of the starting grid. Viñales drops to second place in the championship points behind Dovizioso. Follow this link to full race results. For additional details and points, visit the official MotoGP site. The amazing thing of the entire race event were the calm and truly happy faces of so many fans at the end of the race – I do not know how many athletes or personalities have this gift. hailwood ago and nieto were before my time. they did not have traction control and had to race the isle of man/nurburgring/spa. but,… this guy rossi is really good too. I think Marquez is still the man to beat for the championship. He is about as talented a rider as I have ever seen and extremely adaptable to bike and conditions. Now that he races with more maturity, he is all the more difficult to beat at the long game. Congrats to Rossi. Great win! Lorenzo and Petrucci should swap rides next year. Seriously. I’m enjoying watching Zarco. He’s no flash in the pan. That Frenchman can ride. I think this season will be one of the best. One of the best races I’ve seen in years. Danilo got it. Where is Nadezhda Yakhnich? May be it is better for her tj fly airplanes. Danilo Petrucci has the most epic beard ever. I swear the guy was clean shaven during morning warm-ups today, but by the time the post-race presser was halfway over Our Favorite Caveman was well on his way to resembling King Leonidas kicking haughty fools into that bottomless Great Beyond. Oh, and he’s also officially Right There, in terms of being as consistently fast as anyone on the grid these days. He wasn’t going to hang with Rossi today had it stayed dry—Rossi was clearly checking out on everyone just before the rain began to fall—but once it gets damp #9 is faster than just about anyone. Notice also that he isn’t crashing very much anymore. He’s had some horrific luck this year with mechanical DNFs and other riders taking him out, but by and large he’s been very clean, consistent, and, I daresay, smart. And he’s doing it on a satellite Ducati; one week at a high-speed track like Mugello, the next at low-grip Barcelona, and now in mixed-conditions Assen, where he was among the fastest in every session, rain or shine. In rather stark contrast to one of those other, much more highly paid Ducati riders, no? Ah, yes, Jorge Lorenzo, you magnificent, maladjusted rodent. Gotta love a motorcycle racer who freely admits he can’t cope with racing in mixed conditions, in a series fraught with just such conditions roughly every other week. How refreshing to witness such candor, even as his teammate runs circles around him; heck, even as his satellite brethren stomp mudholes in him. See, Jorge, when Rossi was dying a thousand torturous deaths on that satanic red bike, so was his teammate. It wasn’t as if Rossi was floundering but all the other Ducati riders were killing it. You? Never mind Dovi, or even Petrux, you keep getting smoked by Alvaro Bautista and Scott Redding. Dani Pedrosa is a curious case. He’s basically Jorge Lite, no pun intended. When things are just right, as they rarely are in MotoGP, Dani can sometimes seem untouchable. Similar to Lorenzo, however, when things aren’t right, #26 can’t will himself to burp up a podium anyway by riding around the issue, the way Rossi and Marquez often do. If Dani encounters a cool-ish track, go ahead and assume he won’t be there at the end. He will fade, explaining afterward that he couldn’t get enough heat in the tires so he had to back off. Right…never. This is Dani’s fatal flaw, and the reason he never has and never will win a MotoGP championship. Stick Marc’s heart in Dani’s body, and Dani wins at least two MotoGP titles. Speaking of Marc, he remains the man to beat in this championship. He’s going to win next week. Take it to the bank. #93 literally never loses in Germany. Where Marc Marquez is concerned, America and Germany are like death and taxes for the rest of the paddock. Everyone else is fighting for second place. The scarier thing about Marc right now, however, is that he’s not winning races yet he’s still only eleven points down in the championship, with the majority of his best tracks still to come. A Smart, Calculating Marc on a Repsol Honda is damn tough to beat over the course of an entire season. So far, it’s never happened. The only time he didn’t win the title was 2015, when he was still in Win Or Bin mode. Dovi is not going to beat him. Dovi is steady, fast, smart, and solid as a rock, but he will not win enough races going forward to beat Marc Marquez over the latter half of a MotoGP calendar. As always, and just as we all assumed before the season began, it falls on the Factory Yamaha guys to do the job. I originally picked Vinales to win the title, and he’s still right in the thick of the things, so I will stick with my pick, but my gut tells me now that Marc will overtake him. My gut also tells me that Valentino has already suffered too many huge setbacks this year to get it done, since he won’t win enough of the remaining races to stay ahead of a points-driven (as opposed to a wins-driven) Marquez. Going forward, Rossi could out-score Win Or Bin Marc, especially now that Yamaha has switched back to the friendlier-handling chassis Rossi prefers, but I doubt he can out-score Smart Marc, not with many of Rossi’s favorite tracks already behind him. Le Mans, Jerez, and Catalunya really hurt Rossi. I fear they will ultimately prove to be his downfall. Nevertheless, do not fail to celebrate #46 while he’s still here. God forbid, but he could easily Nicky Hayden or Marco Simoncelli us, and be gone in the blink of an eye. What this man is doing is the stuff of legend, and that’s not empty hype. In the world of motorcycle racing there is no precedent for what he’s doing, so take a moment to appreciate just how privileged we are to be watching the two-wheeled equivalent of Babe Ruth and Wayne Gretzky and Michael Jordan, only this GOAT is still getting it done at age thirty-eight, an age at which all our other racing legends had long since surrendered to the comforts and safety of retirement. If Nicky and Rossi taught us nothing else, it’s that we all need to stop and smell the “facking” roses. When #46 rolls up to his starting position on the grid next week at the Sachsenring, set aside your usual rooting interests and simply marvel at the realization of what you’re seeing, and be glad you were there to witness such a glorious spectacle. This is a golden age, and it won’t last forever. Cherish it while you can. Awesome race, and agree with VLJ’s assessment of the season. And you were on such a roll before you posted that BS! How is it BS? It’s something these guys face every time they flip their visors down and exit pit lane. This is motorcycle racing. We just don’t say things like that. It’s a given and that’s that. Look at how close Vinales came to getting run over by Dovi. Same thing happened to Marco. Could easily happen to any of these guys. Dirck- give this man a job! I resemble that remark. At least Vale is not pulling some mind games with the other racers. I bet #46 is giggling inside with the success of #99. Fantastic, every minute. Couldn’t take my eyes off from tv. Best race of the year for me, and probably the best since Phillip Island two years ago. Strange feeling, this. Happy as heck for GOAT, but also gutted for Petrux. Really want to see Danilo win one this season. in the equation above “reality” =’s DODGY MICHELINS. That among other things – I mainly meant he seems to have been counting some unhatched chickens aka championship points after his rocket start to the season. Oh but another big Reality Component for him is starting to look to be VR’s weight in setup/bike choices etc. Wasnt’ Rossi, Dovi, Pertucci, Marquez and Crutchlow on Michelins as well? They seemed to be doing ok! …except when they took DIGGERS. We can’t pretend that crashes don’t happen every year. There’s been some peculiar tire performance issues but these guys are pros, they ride to and past their limits, regardless of who makes the rubber. Rossi qualified 4th and Viñales qualified 11th. Rossi won the race and Viñales crashed out. They were both on Michelin-shod, factory Yamaha YZR-M1 motorcycles prepared by the same team. “after qualifying” would be the operative phrase there. right, as we see POST CRASH he (Mav) was everything on this issue Norm is NOT. ladies and gentlemen of the Jury, if it pleases the Court, i now submit “Exhibit A” into evidence, thank you. This Assen GP race had more drama than any other race I can ever remember watching. And I’m no youngster. Once again Rossi surprises me at his abilities at his age. For a while there I thought Dovi might win another race this season. But no, Rossi pulled another rabbit out of his hat! 8^ 0 Zarco is still showing us he’s no typicle rookie too.